This article first appeared in Just Jazz Guitar Magazine. Many guitarists find themselves at a loss when first asked to take on the role of the sole harmonic instrument in a small jazz combo. 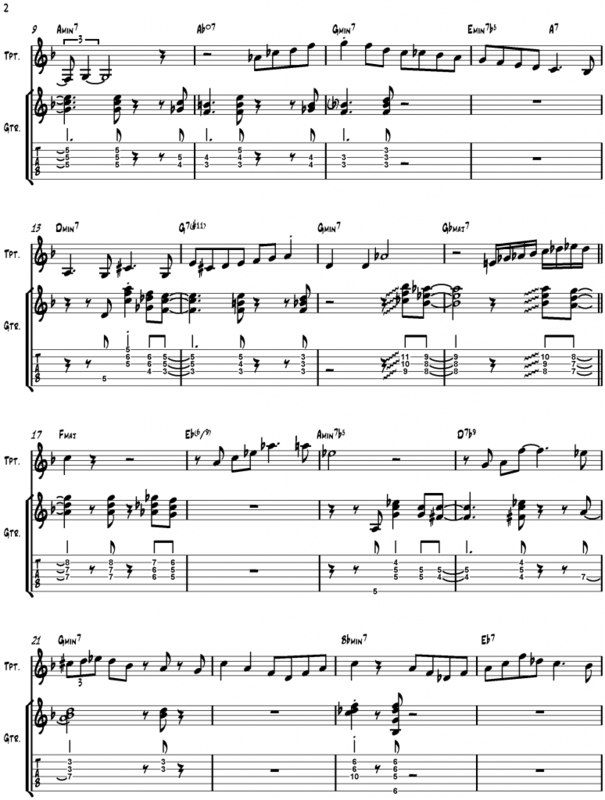 Often times, jazz guitarists develop their comping as members of a big band rhythm section, where three-note chord voicings with the root in the bass and four quarter notes to the bar are stock-in-trade. 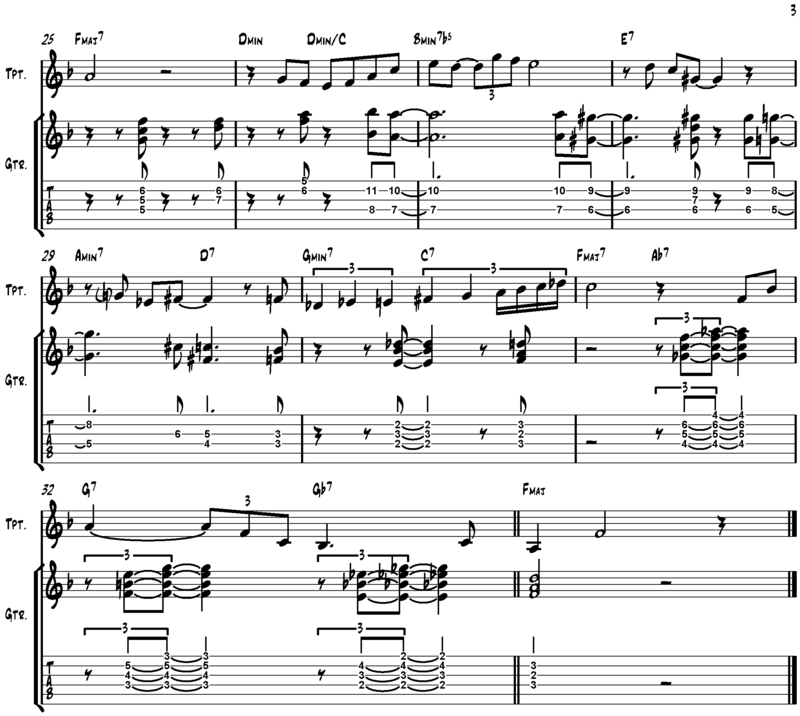 This traditional style of rhythm guitar does not always transition well into the small jazz combo, and many guitarists without small group combo experience are left with questions about voicings, rhythms, and balancing silence with interaction. Mastering accompaniment, like improvisation, is a life-long process and is best developed by studying the recordings and transcriptions of the master musicians. 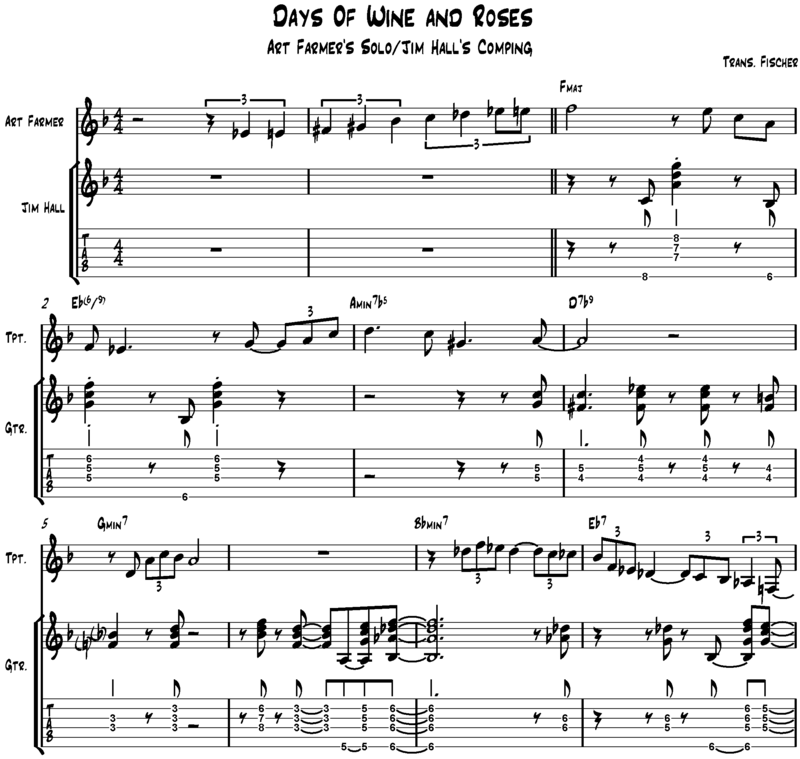 In this article, we will study guitar comping in the rhythm section by looking at Jim Hall’s accompaniment behind Art Farmer’s solo on the standard “The Days of Wine and Roses,” from Farmer’s 1963 album Interaction. Jim Hall helped popularize the use of the guitar as a valid replacement for the piano in the rhythm section through his sideman work with such high-profile artists as Sonny Rollins, Art Farmer, Paul Desmond, Chico Hamilton, and Jimmy Guiffre during the 50’s and 60’s. Often cited as the father of modern jazz guitar, Hall’s accompaniment style in each one of the aforementioned artists’ recordings details how Hall adapted to the musical demands of each situation. 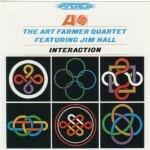 As the album title states, the Art Farmer quartet of 1963 and 1964 was based on active interaction between its members, which also included Steve Swallow on upright bass and Walter Perkins on drums. In a performance on Ralph J. Gleason’s television series, Jazz Casual, the host asked Farmer about his decision to use guitar instead of piano in the rhythm section. Farmer’s praise of Hall suggests he was one of the few guitarists at that time who had successfully adapted the bop-influenced piano comping style for the specifics of the instrument. By examining Hall’s comping texture, voicing types, and specialized techniques in the transcription, the reader can develop a stronger understanding of the skills and vocabulary necessary when comping in the small group. Hall’s use of the traditional style of four to the bar rhythm guitar chunking played on the melody chorus, as well as the more pianistic comping style employed behind the horn solo, helps demonstrate his understanding of the value of both styles of comping. Hall is vocal about his passion for Freddie Green and the importance of mastering the traditional style of guitar accompaniment, but understands that imitating the rhythmic and harmonic vocabulary of a pianist in the small group context allows more interaction with the soloist. Such interaction with the soloist is on display during pauses in Farmer’s solo. Hall plays short counter-melodies between Farmer’s phrases that help convey a sense of conversation between soloist and accompanist. Hall’s melodies are both interactive and functional, and clearly state the underlying harmonic progression as in the following example. When Farmer is playing, Hall’s comping features staccato chordal stabs and copious amounts of space. This comping approach ensures that the soloist has the maximum amount of freedom during his improvisation. Rhythmically, Hall balances placing his chords on both downbeats and upbeats. Notice how in the following example Hall’s rhythm helps create a “melodic” phrase. The beginning of his comp emphasizes beat one, the middle emphasizes the upbeats of beats two, three, and four, and the end of the comp emphasizes the downbeat of the next measure. Also pay attention to the contrast of sustained chords placed on downbeats with the staccato hits on upbeats. Try singing the rhythm before playing the example on your guitar to help internalize the example as a phrase. One of the most challenging aspects that guitarists encounter when replacing pianists in the rhythm section is coping with the guitar’s limitations of range and the amount of notes that can be played at one time. Hall’s chord voicings in the transcribed chorus demonstrate that it is not necessary to play thick voicings in order to be an excellent accompanist. Many of Hall’s chords are two-note “shell voicings,” called so because they contain the bare-minimum amount of harmonic information: the 3rd and 7th. 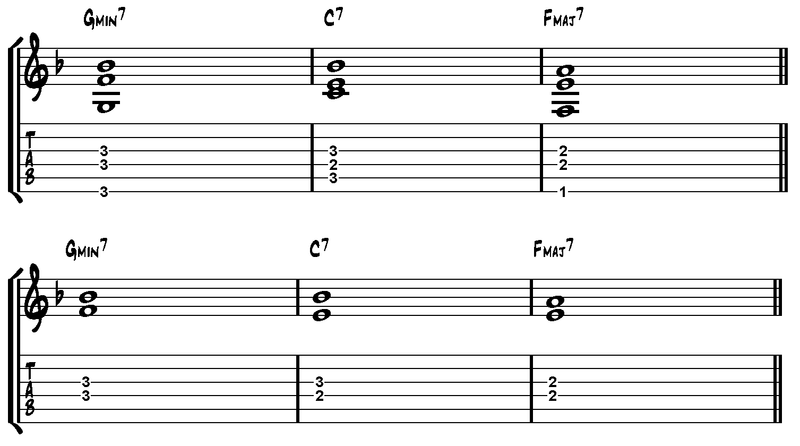 Notice the smooth voice leading that occurs when shell voicings are utilized in the following ii-V-I progression for the key of F.
When one chord transitions to the next in this common progression, one note moves down by a half-step while the other acts as a common tone. Hall highlights this half step voice leading at the end of the chorus by playing the moving voice of the shell voicing in octaves. In addition to using shell voicings, Hall employs chord voicing types that are commonly found in the pianist’s left-hand chord vocabulary. Voicings that feature minor 2nd intervals provide interesting harmonic “crunches” that are easily achieved on piano but often require left-hand stretches on guitar. Hall also uses stacked 4ths voicings for a more modern sound; these chords are much easier to play on guitar due to the instrument’s tuning. Notice Hall rarely plays chord voicings that contain the root in the bass. It is assumed that the role of establishing the root of the chord in the rhythm section will be taken on by the bassist. For most beginning jazz guitarists, it is an important but difficult transition from playing 7th chord voicings with roots in the bass to three- and four-note chords that are in the middle and top string groups. Guitarists interested in developing this chord vocabulary should memorize Hall’s voicings and be aware of how each note in the chord functions over the implied bass note. For instance, the first chord of Ex. 5 is comprised of the 9th, ♭3rd, and 5th of Gmin. Developing this harmonic awareness is difficult at first, but becomes second nature after focused practice. Throughout the transcribed chorus, Hall presents several comping techniques that are worth noting. Hall utilizes notes on the low E string of the guitar as rhythmic pickups into mid-range voicings. This subtle effect helps provide rhythmic drive in Hall’s comping. On several occasions, Hall approaches a chord by playing a voicing a half step above the target. Hall also makes use of articulations that are not easily achieved on the piano, such as sliding in and out of voicings. Play through the chorus of comping slowly, learning all of the chord voicings Hall uses and identifying which pitches are contained in each voicing. Then, pay particular attention to Hall’s rhythmic vocabulary and the melodic line he creates on the top of each of his voicings. Once you can play through the chorus from memory, try playing along with the recording and noticing how Hall’s comping choices interact with the soloist. As with improvising, good comping requires the mastering of the basics of voicings and rhythm that allows the accompanist to be supportive, interactive, and spontaneous. For more examples of Jim Hall’s comping in piano-less quartets, be sure to listen to The Bridge by Sonny Rollins, Live at the Half Note by Art Farmer, or any of the albums Hall recorded with alto saxophonist Paul Desmond, collected on The Complete Recordings Of The Paul Desmond Quartet With Jim Hall. Note: Chord symbols in the following transcription reflect the general harmonic progression, not Jim Hall’s chord voicings. 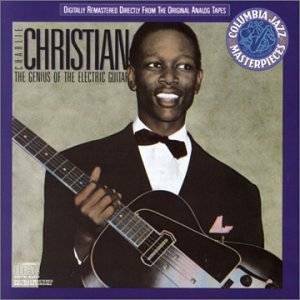 Christian’s solos contain the perfect balance between swing rhythmic figures and proto-bebop eighth note runs.